Last week, I wrote a post called Wish You Were Here, in which I dared to dream of a better world where some of the top Chinese restaurant groups set up shop in London. Dreams don't come true, do they? Well they don't unless you do something about it. So inspired by Cheese and Biscuits' campaign to bring the esteemed burger chain, In-N-Out to London, I'm asking my loyal readers (all nine of you) to help bring Din Tai Fung (鼎泰豐) to the capital. This restaurant is renowned for its Shanghai-style dim sum, in particular its legendary soup-filled dumplings, xiao long bao (小籠包). Whilst Din Tai Fung isn't at the top of my wish list; it is the only one that operates outside of Asia and is therefore most likely to open in the UK. After all, if they have branches in Los Angeles, Sydney and Seattle, there's no reason why Din Tai Fung can't open in London? The days are getting colder and the nights are drawing in. It's that time of the year when you want your grub to cheer you up so in this post I'll be looking at three great places for comfort food: a rather special pub, somewhere a bit posh and a good old-fashioned Italian. Toulouse cassoulet is exactly the kind of food that soothes the soul and it's one of many hearty dishes served at The Gunmakers. Being a Northerner, I'm prone to moaning about meagre 'London portions' but I had no complaints about this mammoth serving. However, it wasn't just the quantity that I was impressed with; I was also struck by the high quality of the ingredients. The haricot beans, ham hock, and pork shoulder were all top notch but a special mention goes to the Toulouse sausage. I was quite full after this feast and it was a shame that I had to go back to work, as I could've done with a couple of pints and a kip. The Gunmakers is a cracking boozer and it's also worth mentioning that they serve a fine array of ales. Bob Bob Ricard needs little introduction. This Soho restaurant has been blogged to death and this particular meal has already been blogged about by Catty and The Grubworm. The menu is full of heart-warming dishes like fish soup, beef wellington, pies and burgers. But to start, I couldn't resist the retro charms of the prawn cocktail. Mind you, part of me wishes I ordered the venison steak tatare. For mains, my dining companions shared a roast leg of Elwy Valley lamb; I had a taste and it was damn good although my veal Holstein was none too shabby either. Served with anchovies, quail egg, truffled mash and secret sauce (not to be confused with special sauce), I loved it. The puds are good too and I couldn't say no to warm chocolate fondant. I'm a big fan of the decadent dining room and the fact that everyone is seated in a booth. In addition to the classic comfort food, there's also a small selection of Russian dishes. I might try these next time with a shot or two of their vintage vodkas. Not that you need me to tell you but BBR is highly recommended. I can't believe that I haven't got round to blogging about Ciao Bella 'til now. This charming old school ristorante is a favourite office lunch venue of mine. I've been a regular for the best part of a decade and come to think of it, I've probably eaten here more times than any other restaurant. And whilst I've not seen him eat at Ciao Bella, it seems that Raymond Blanc is a fan too. The menu doesn't push any boundaries but that's its appeal, as sometimes I don't want to think too much about my food. My favourites include spaghetti con polpette (spaghetti with meatballs) and scaloppa Milanese (I usually order this veal dish with a side of pasta instead of the usual potatoes and veg). But above all else, I adore their pizzas, in particular the prosciutto crudo. Ciao Bella is always busy and booking is recommended. That said if you turn up without a reservation, they have an arrangement with the pub next door. You can wait in the pub and once a table is ready, they'll come and fetch you. If you haven't finished your drink then you can bring that through too. Now that's what I call service! TomEats inspired this post after he left a comment on my review of Mushu. The gist of his comment was that the likes of Crystal Jade and Din Tai Fung would clean up in London given Mushu's mediocre efforts at regional Chinese cuisine. To the uninitiated, Crystal Jade and Din Tai Fung are Chinese restaurant chains with branches across East Asia and beyond. However, these aren't chains like we know them in the UK. They consist of highly accomplished restaurants, so much so that one of Din Tai Fung's Hong Kong branches has a Michelin star. Tom's comments made me wonder what other Chinese restaurant chains would excel in London. I soon came up with a Top 5 wish list; these aren't necessarily my favourites but rather those restaurants that I believe would 'work' in the capital. They're a varied bunch and hail from all across the Chinese-speaking world and it'd be amazing if just one of them came to these shores. I'm not getting my hopes up but you never know who might be reading. The stylish and sophisticated Xiao Nan Guo would be my top choice to open in London as the capital is desperately short of restaurants that serve Shanghai cuisine. I'm pretty sure that their refined take on this cuisine, which can sometimes be too rich, would go down a storm. And whilst Xiao Nan Guo's dim sum isn't quite as good as 2nd placed Din Tai Fung, their exquisite main courses win the day. Moreover, their website mentions global expansion plans that includes Europe – please make it happen. In foodie circles, Din Tai Fung has legendary status and on another day I would've chosen this Shanghainese dim sum restaurant ahead of Xiao Nan Guo. There really ought to be a warning before you eat here because once you've sampled their xiao long bao, most other efforts at these soup-filled dumplings will seem second rate. From humble beginnings in Taiwan, this chain has spread far and wide. With branches in Los Angeles and Sydney, there is a chance that they might one day open in London. I can see Bellagio being hugely popular anywhere due to its universal appeal. It's more casual than the other places on my list and the kids would just love its trendy drinks and desserts. At the same time, there is a wide choice of Taiwanese classics to satisfy old gits like me. It's this beguiling mix that has seen more than one London blogger proclaim this café to be a Beijing must-visit. Sadly, I don't think there's much chance of Bellagio opening in London, as so far expansion has been limited to China. From a single restaurant in Singapore, Crystal Jade has expanded across East Asia with a mix of different cuisines and concepts. Originally renowned for its Cantonese dim sum, nowadays Crystal Jade is arguably better known for its 'La Mian Xiao Long Bao' concept. This combines Lanzhou hand-pulled noodles with Shanghai xiao long bao and London really could do with more of both. Here's hoping that the UK will be the first country in which this chain will operate in outside Asia. No less than six branches of Lei Garden have a Michelin star – there can't be too many restaurant chains that can boast that achievement. I've not eaten at any of their Michelin-starred outlets in Hong Kong or Macau but the dim sum feast I had at their Singapore restaurant was different class. That said TomEats was less than impressed by the IFC branch in Hong Kong. It's all academic anyway, as I think Lei Garden's expansion plans will focus on China for the time being. There are some restaurants that I've omitted from my wish list not because they aren't good enough but because they're too good. For example, Beijing's Ya Wang breeds its own ducks and puts them on a special diet before roasting them in an oven that uses a particular kind of wood. I'm not sure you can replicate those conditions easily outside of Beijing. Then there's the amazing contemporary Chinese cuisine of Dadong. The quality of this Beijing mini-chain is inextricably linked to Chef Dong and I can't see how standards can be maintained if he also opens a restaurant in London. As I mused at the beginning of this post, it's highly unlikely that any of these chains will actually open in London. So for now, I'll have to make do with my fantasy that Xiao Nan Guo is my local Chinese restaurant and that Din Tai Fung have taken over each and every branch of the execrable dim sum chain, Ping Pong. Lastly, what restaurants from faraway places would you like to see open in London? ﻿Dim sum is one of the great restaurant experiences, as it is very difficult to recreate at home from scratch. I mean who has the patience and expertise to knock up a selection of dumplings, buns, and rolls that are variously steamed, baked, fried, and grilled? So the only viable way to enjoy these treats at home is to get some in. You can buy pre-prepared dim sum from your local Chinese supermarket. Whilst obviously not as good as restaurant dim sum, some shop-bought items can be quite good, e.g. roast pork buns (cha siu bao 叉燒包). That said the more delicate dumplings like har gau 蝦餃 don't quite hit the mark. This is all well and good if you can get to a Chinese supermarket but if you can't then you have to rely on High St shops like Marks And Spencer. So in the interest of research, I popped into my local M&S to buy some dim sum from their 'Taste East' range. Thank God, I didn't bump into anyone I knew. I'd have a hard time explaining what I was doing with M&S dim sum! This is M&S's take on the prawn dumpling (har gau 蝦餃), one of the best known dim sum. First impressions weren't good as the pastry was far too thick and claggy and there were only 7 or 8 pleats. Things didn't get any better once you bit into it, as there was hardly any filling. I could barely pick out the prawn and there were all kinds of superfluous crap in there like water chestnuts, courgettes and carrots. One plus point was that the dumplings were well seasoned with a nice aroma from the sesame oil. Siu mai 燒賣 is another dim sum stalwart and is traditionally made with pork and prawn but this version is vegetarian with rice and various vegetables in the mix. That said, other than the rice, the only ingredient I could actually pick out were the black-cap mushrooms. The seasoning wasn't that balanced with an overriding taste of pepper. They were also over-glutinous and prone to breaking up. It was a real struggle to transfer the microwaved dumpling into the steamer for the photo, so in the end I gave up! Having eaten the steamed (microwaved) efforts, I was beginning to get really depressed. My mood wasn't lightened when I retrieved these spring rolls 春卷 from the oven. Being oven-baked rather than deep-fried meant these rolls weren't particularly crispy. There also wasn't much prawn in them and they really ought to have been called water chestnut & coriander spring rolls. In fact the best thing about these was the coriander although in fairness they weren't badly seasoned. Each of the above snacks cost £2.49/pack or £5 for any three from the 'Taste East' range. In the case of the prawn dim sum and vegetable siu mai, you get six per pack and it's recommended that they be microwaved for 'best results'. There are four prawn & coriander spring rolls in a pack and these should be oven-baked. I wasn't expecting these to be brilliant but I did expect better from M&S. I'm not sure under what circumstances you would actually buy these efforts at dim sum. A waste of a fiver. Now I wasn't expecting something that you might find in Shanghai but for £6.50, I was expecting more. For starters, I would've preferred my meal not to be served in one of those American-style take-out boxes. I was eating in and call me high maintenance but crockery would've been nice. Moreover, these weren't really lion's heads, which ought to be super-sized; they were just four not particularly large meatballs. They had also been incorrectly wok-fried – I could tell from the charring – rather than properly steamed or casseroled. On the plus side they were juicy and well seasoned and with the 30% discount voucher, I paid £4.55, which seems a fairer price. Before you think that I'm really stingy, I'd pay £5, hell I'd even pay £5.50 but £6.50 is a bit too much for a quick lunch served in a take-away container. Returning the next day, I decided to try Mushu's speciality, Beijing dumplings, which you can see being made in the open-plan kitchen. Available in three varieties, classic pork, beef & kimchi, and vegetable, these are served either boiled (shuijiao 水餃) or pan-fried (guotie 鍋貼). As well as ordering them on their own, you could do what I did and order a dumpling noodle soup (£6). From the various permutations, I decided on pork dumplings with egg noodles (the alternative is something called Shanghai udon – don't get me started on this improper noodle terminology). Again I was a bit disappointed, as there were only four rather petit dumplings. They were well made although the filling could've done with some chives. The broth was neither here nor there and I wasn't a fan of the thick egg noodles that would be more at home in a stir-fry. Perhaps what they call Shanghai udon might have been a better option. I also didn't like the disposable container it was served in; being more like a giant cup than a bowl, it was a pain to fish the noodles out of the bottom. And again price was an issue. This kind of fare should cost £5 tops, if they want to charge £6 then it needs to be a better quality product. Mushu is a casual joint serving a short menu consisting of simple Chinese and Japanese dishes. You order at the counter and whilst there are individual tables, much of the seating is communal. Other than the fare that I sampled, the most noteworthy Chinese dish is the Beijing classic, spicy ja jiang noodles (zhajiangmian 炸酱面); whilst the Japanese choices include yaki soba and chicken katsu curry. I'm normally apprehensive when I see places that 'mix and match' cuisines but given the brevity of the menu, there's not much scope to balls things up. I've had a good moan about the prices but there is a 10% discount for students and NHS staff. Very handy for those that work or study at the nearby University College Hospital. I really wanted to like Mushu as treats like lion's head and freshly made Beijing dumplings are all too rare in London. Unfortunately, I think the food is ordinary and overpriced, and compares unfavourably with the likes of Hare & Tortoise. It's pretty poor that five months have passed since my last post in this occasional series on the world of noodles. I'm going to make up for lost time with a feature on a right proper posh noodle, e-fu noodles (伊府麵) aka yi-mein (伊麵/伊面). These Cantonese noodles are made with egg and wheat and are famous for their chewiness, which is due to the use of soda water when making the dough. I think I'm right in saying that e-fu noodles are only available in dried form and I've never seen them sold fresh (生). Traditionally these noodles are served at the end of banquets, be it for birthdays or weddings, to wish for a long life or a long marriage respectively. However, as people have become more affluent, this occasional treat has become an everyday item. In particular, they are a popular accompaniment to dim sum and it's a fair assumption that a proper dim sum restaurant will also serve e-fu noodle dishes. E-fu noodles are refreshed in boiling water for a minute or two and are then served in soup or braised but rarely (if ever?) stir-fried. The above photo shows them served in soup with fish balls and pak choi based on this recipe. For a braised noodle recipe, let me direct you to the incomparable 3 Hungry Tummies. Other popular combinations that I've come across include crab & conpoy with e-fu noodles (蟹肉瑤柱伊府麵) and enoki mushrooms with e-fu noodles (素金菇伊府麵). If you want to try these noodles at home then you can pick them up at Chinese supermarkets. I can recommend the Kamfen (金粉) brand and you can get a five-portion pack for £3.49 at Loon Fung in London's Chinatown. These come with accompanying sachets of soup mix, usually seafood or chicken flavour, but you can get packs that come without the soup. Mr Fussy, Italian Shetland Pony, Mr Frosty and the Black Widower are amongst the first friends I made when I moved down to London as a callow 21 year old. Most of them have since left the smoke but we try to meet up at least once a year. This year's reunion was in Manchester and by the time we all pitched up to the hotel, it was time for lunch. We decided to visit Chinatown, which for me was also a trip down memory lane. It's hard to believe that it's over thirty years ago since my parents first brought me here. It's from my parents that I have a passion for food but the reason why I love noodles is all to do with Manchester. Are you sure this is Chinatown? Give me the map! During school holidays, we'd go on family outings to Manchester for dim sum with a healthy side order of noodles. Sometimes we'd order wonton noodles (雲吞麵), other times it'd be three roasts with crispy noodles (三燒麵) and let's not forget my old friend, beef ho fun (乾炒牛河). The noodles were a treat as we mainly ate rice and chips at home (everyone eats chips in Lancashire, even the Chinese). To this day, I adore noodles and that's why I adopted the moniker, Mr Noodles! I fear I'm turning into Kevin from The Wonder Years so lets fast-forward to the here and now. Manchester's Chinatown has evolved from being pretty much 100% Cantonese to encompassing other Chinese cuisines, most notably Sichuan, as well as other Asian cuisines like Japanese and Thai. With such a bewildering array of options, I had no idea where to go. It also didn't help that many of the best places for dim sum aren't in Chinatown, e.g. my parents' favourite, Tai Pan. In the end, we plumped for The New Emperor because it was busy. I'd been here before but it was so long ago that I had no idea whether it'd still be any good. The clientele was mainly Chinese, as was reflected by the Chinese-only dim sum order form, and whilst there was a menu in English, it wasn't cross-referenced to the form. I ticked off as many items I knew the Chinese for (not many) before conceding defeat and getting our very helpful waitress to complete the order form. The dim sum isn't the most delicate but it is freshly made, well seasoned and generously proportioned. I can't remember everything we ordered but I do recall that everyone really liked the ginger & spring onion beef dumplings (薑蔥牛肉餃). Consisting of beef and ginger wrapped in bean curd skin, these zingy treats were steamed with a soy-based sauce and topped with spring onions; a great combination of classic Cantonese ingredients. There were one or two misfires but I could live with that as this veritable feast cost a mere £10/head, which included loads of dim sum, a giant platter of three roasts with crispy noodles (三燒麵), tea and a tip. An amazing bargain and none of us could remember the last time we ate so well for a tenner. It isn't as good as the best dim sum in London but it's certainly better than the stuff found in the capital's Chinatown. But it wasn't the quality of the food or how cheap it was that made this meal special; it was the good company and the convivial atmosphere. I know I'm forever banging on about this but there really is something special about the vibe in old school dim sum joints like The New Emperor. I think the Black Widower had it spot on when he proclaimed this restaurant to be 'a classic of its genre'. Why is Manchester Town Hall not called Manchester City Hall? After lunch, we waddled over to the imposing gothic Manchester Town Hall, where the Manchester Food & Drink Festival was being held. As we were stuffed, we ignored the food and sampled a few local brews from the Greater Manchester Ale Festival bar. This was a more than pleasant way to spend the afternoon and these were followed by a few more snifters around town before dinner. Dinner was always going to be a curry given that Mr Frosty, who currently resides in Helsinki, finds it hard to get a decent ruby in Finland. He also has a hard time in getting the Finns to smile but that's another story. Like its Chinese food, Manchester's Indian food is amongst the finest in Britain and the 'curry mile' in Rusholme tempted us. However, we couldn't be arsed to get a cab to south Manchester so we ended up in East Z East just off Deansgate. This is an opulent restaurant with a plush interior that features palm trees! I was a bit suspicious of the bling but the selection of seven different pickles that arrived with the poppadoms allayed my fears that this place might be an exercise in style over substance. I really enjoyed my main of chicken methi, this fenugreek based curry made a nice change from my usual order of dopiaza or jalfrezi. I also liked the giant naans that seem to divide opinion amongst curry lovers. I can't remember what everyone else ordered but judging by the largely empty plates, the food went down well. Highly recommended and the Italian Shetland Pony also rates the Preston branch of this mini-chain. After a nightcap or two, we decamped to our hotel, the City Inn, a great choice by the boy Pony. In the morning, we kicked off with an above par full English that was cooked to order. Unfortunately, the dismal weather put paid to the rest of our plans so we ended up hanging out in cafés and wandering around the Arndale Centre. After leaving 'Eat Noodles Love Noodles' on assorted iMacs and iPads in the Apple Store, we went for a final brew at Druckers. I wasn't going to eat but I couldn't resist ordering a toasted currant teacake with butter. This Lancastrian classic brought back memories of a time when Britain wasn't shackled by the corporate chains of Costa and Starbucks, and traditional treats like these were more common. It was also nice to eat one as a final reminder of the beautiful North. As always, it was great to meet up with everyone and I'm already looking forward to the next reunion. Postscript: There was one low point during the trip and that was Duckgate. At The New Emperor, we tucked into a platter of three roasts with crispy noodles. All of it was delicious but the roast duck was different class with its glistening crispy skin. So you might wonder what kind of a man would toss the skin aside with the bones. A betting man might've had Mr Fussy down as the prime suspect but it was Italian Shetland Pony who was guilty as charged. But don't worry; I ate the skin before giving ISP, a stern lecture on why crispy duck skin should NEVER be discarded. Young Cheng in the heart of London's Chinatown has been on my radar for a few months ever since Pa Noodles bought some superior take-away Cantonese BBQ there. I finally got round to eating at this restaurant the other week. I was going to order some three roasts noodles (sam siu mein 三燒麵), before another dish caught my eye. 福州魚蛋湯河 Fuzhou fish ball ho fun in soup (£5.50) screamed out to me from the lunch menu and was begging to be ordered. 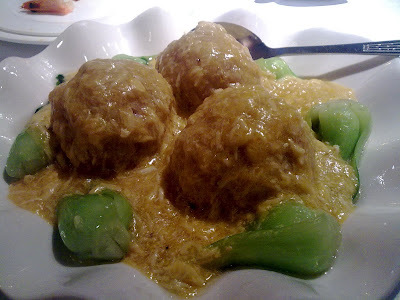 However, I had some reservations owing to some bad fish ball experiences at HK Diner and Fuzhou Restaurant. Things were so bad in the state of fish ball that I resorted to rustling them up at home. Thankfully, this bowl of noodles went someway in restoring my faith in the humble fish ball. After all, I could have no complaints about the generous helping of six puffy fish balls filled with ground pork complemented by slippery smooth ho fun noodles (河粉) in a bowl of clean tasting broth. The fish balls were reassuringly misshapen, which to me indicated that they were own-made but sadly they weren't that 'QQ' or springy. That said, the ground pork filling – the defining feature of Fuzhou fish balls – was juicy and flavoursome. The broth would've been a tad plain but for some fried garlic bits that ever so subtly gave it a lift. I also bought a portion of take-away roast belly pork (siu yuk 燒肉). This had nice crispy crackling and plenty of five-spice flavour. A winner and a bargain at £5.50; I'll be sure to return and sample the rest of their roast meats. I visited the Lisle St branch of Young Cheng, there are a couple of others in Chinatown, and it's a bit of an 'all things to all people' kind of joint. At lunchtime, it serves dim sum and one-dish meals whilst the main à la carte selection includes Cantonese favourites of both the hard-core and tourist-friendly variety. In common with many Chinatown joints, service was fast and furious but without being too brusque.